New Delhi / Vienna, Aug 3 (IBNS): Even as four eagles fitted with cameras have been circling over Vienna capturing breathtaking images of the Austrian capital, on the ground the city has hosted 7.2 million travellers in January-June 2018 – a 4.1 per cent increase in tourist arrivals over the same period last year. There was a 4.3 per cent rise in Indian tourists to Vienna this year with 66,828 bed nights clocked by them in the first six months. India is one of the high growth tourist markets for Vienna along with China and Russia. Last year in the same period, 64,075 Indians winged their way to Vienna. Tourist arrivals rose to 30,445 in Jan-Jun 2018 recording a growth of 5 % (compared to 29,022 the same period last year). Month of June 2018 saw a growth of near 8 per cent with Indian travellers recording 23,499 bed nights. Tourist arrivals grew 11.7 % to 10,659 in the June 2018 period from 9543 in the year ago period. The rising number of Indian travelers to the city of castles and palaces has been aided by growing direct air connectivity. India's national carrier Air India had been operating a direct Delhi-Vienna flight three days a week. This year, the Maharaja added one more flight to the Austrian capital in its summer schedule enhancing seating capacity by 33 per cent. Vienna’s exciting calendar of cultural events for 2018 has also played no small part in the pull of Indian travelers to the city. This year the European city is celebrating Viennese modernism and is hosting year-long exhibitions on the theme of Beauty and the Abyss, showcasing the seductive works of Gustav Klimt and the brilliance of Egon Schiele, celebrating architect Otto Wagner and artist Koloman Moser. In 1918, the lives of these four key people who figured in a big way in Austrian cultural history came to an end. A hundred years later Vienna is paying moving tribute to their legacies -- making it a must visit place for art lovers around the world. Now yet another attraction for fans of this beautiful city is a unique film of Vienna from an unusual perspective. The world premiere of the aerial movie shot by the eagles is now available for tourists in 360 degree format to double their pleasure of this breathtaking city. The making of the film is a veritable story in itself. 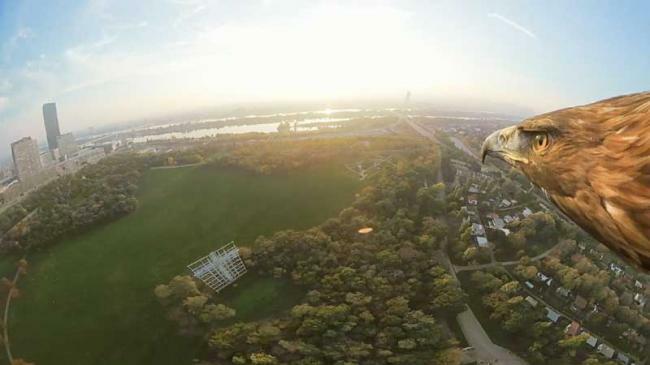 Bruno and Fritzi, golden eagle siblings set off in a hot air balloon launched from the Palais Schwarzenberg grounds with cameras on their backs in October 2017 recording pictures of Vienna. Soon they were joined by French sea eagles Darshan and Victor who swooped down from Danube Tower at a height of 160 metre capturing the autumn scenes of Danube island. The birds, expert trained film-makers, have been circling above Vienna over the last few months taking amazing shots of the city that no human could have taken. The eagles captured bird’s-eye views in stunning 4K resolution supported by the production company Red Bull Media House, who were brought on board to give the Vienna Tourist Board campaign wings. “The project was a world first – never before had eagles wearing 360° cameras been used to capture footage of a major city,” said Norbert Kettner, CEO of the Vienna Tourist Board. All necessary animal welfare clearances were obtained before starting the project and none of the eagles – wearing lightweight cameras – came to any harm during the filming. Travel enthusiasts can watch the film online, and experience the capital in 360 degrees – the experience will be enhanced with VR headsets. Once you have watched this amazing film, who can resist taking a flight to this delightful city that resounds with spellbinding music, conversations in quaint coffee houses and combines the classical with the contemporary with panache.